A newspaper report explained that he had been out with friends celebrating the end of his final exams when he staggered past two police officers on horses in the early hours. Despite requests to desist, the inebriated Sam Brown repeatedly asked an officer if his horse was gay. As a result, he was arrested under section 5 of the Public Order Act for making homophobic remarks and ‘causing harassment, harm or distress’. He was handcuffed, taken to a nearby police station and freed the following day. He was fined £80. A Police spokesman said, “Although he thought calling a police horse gay was funny, it could cause offence to people walking past.” However, the case was thrown out of the Oxford Magistrates’ Court, for lack of evidence. ‘Walking on the cracks in the pavement’. ‘Walking in a loud shirt in a built up area during the hours of darkness’. And one of my favourites, ‘Walking around all over the place’. He was also arrested for ‘Urinating in a public convenience’ and ‘Looking at me in a funny way’. Campaigners argued that the law had created an ‘authoritarian’ and ‘controlling’ society. There was a ‘new intolerance’ – an intense desire to ‘gag’ uncomfortable voices of dissent. However, such issues are not addressed by silencing the opposition through the force of the law, but by airing and debating them in a robust and open manner. Society, they said, needed to toughen up, so as not to take offence at any criticism. 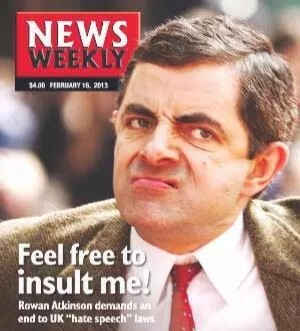 While the Reform Section 5 Campaign succeeded in removing the word “insulting” from British law in 2014, it remains in New Zealand law – raising concerns over whether it too is having a ‘chilling effect’ and should be removed. Under Sections 61 and 131 of the Human Rights Act, it is unlawful to promote anything “threatening, abusive, or insulting”, that could create racial disharmony. While the penalty is imprisonment for up to 3 months or a fine of up to $7,000, the Human Rights Commission claims that the threshold for complaints is high, and must be balanced against the right to free expression. The executive chairman of Saatchi & Saatchi, New Zealander Kevin Roberts, has just found out how dangerous it is to speak the truth, having been forced to resign last week, following a storm of criticism from feminist groups after he challenged a prevailing view about diversity. When asked by a reporter whether there was a problem with a lack of gender diversity in the advertising industry, he said, “not in my view”, and that he wouldn’t waste any time worrying about it at his company. A furore also erupted last week over the Chiefs rugby team’s behaviour on a night out after losing a rugby semi-final, when a stripper who had been hired, accused the team of heckling and groping her. By the end of the week, she had issued an apology: “I sincerely apologise for my comments, I feel terrible that my poor choice of words have caused hurt and alarm… I most definitely do not condone any kind of mistreatment of women and am extremely regretful that my words do not reflect the high standard I expect of myself and those I am associated with.” Whether the apology saves her, remains to be seen. While calling a spade a spade has always been a fundamental part of the ‘Kiwi way’, people are more reluctant to speak out nowadays for fear of being targeted and accused of racism, sexism, homophobia – or the multitude of other politically correct labels used to silence opponents. But there is a real danger to society when people no longer feel they can speak the truth, especially in the public policy arena, where robust debate is crucial. Unchallenged, there is a real risk that such misconceptions could become the accepted orthodoxy – instead of being seen as part of the ideological agenda of the Maori supremacy movement. In reality, since it is the breakdown of the family that creates the environment for child abuse to flourish, meaningful change, will only come through policies to strengthen the family. It’s very dangerous indeed when society muzzles free speech. To debate complex issues, the right to speak our mind and stand by our beliefs – even at risk of insulting or offending others – is crucial. Surely free speech is far more important than appeasing the sensitivities of those who take themselves and others too seriously. Do you believe “insulting” should be removed from the Human Rights Act? The P C madness that has been introduced to dumb the population down, is of course working as planned. Socialist law dictates that we are all equal. Consequently the civilized races are expected to stay at the level of the stone-age people who would not have invented the wheel yet. The National branch of the Labour Party, headed by ‘Key’ are all infavour of this. I can-not be insulted or offended when Leonie Pihama claims Maori babies were safe from harm before colonisation, yet she is insulted if I remind her that these same babies were killed & eaten, long before the arrival of the European immigrants. I rest my case.. A.G.R.